Hoʻokipa Beach Park, the original home of contemporary surfing on Maui, is one of the island's best-known shoreline landmarks. Maui Agriculture leased the land for the park to the County of Maui in 1933 and in a land exchange conveyed title to the Territory of Hawaiʻi in 1947. The name Hoʻokipa means "hospitality." Probably the foremost promoter of the park's fame not only on Maui but throughout Hawaiʻi is a beautiful song that is today a Hawaiian standard. It was written by Alice Johnson, who because of her beautiful voice is still called "the Songbird of Maui." In 1936, while Alice was singing with the Royal Hawaiian Band, her family moved from Lower Paʻia to Kuʻau. In 1937, after returning to Maui, she and her sister decided to walk over and have a look at the park in their new neighborhood. A close family friend was the park keeper, and when the two young girls arrived, their friend had just finished her poi lunch. Then she lay down on the lawn under a hau tree and fell asleep for the remainder of her lunch hour. At that time there were many hau trees and a wide white sand beach fronting the park's present seawall. The serenity and beauty of the setting inspired Alice to write the song she entitled "Hoʻokipa Park Hula." The surf offshore from Hoʻokipa Beach Park provides surfers with waves almost all year round, as the reefs pick up both summer and winter swells. The most spectacular waves, however, occur during the winter and often reach heights of ten to fifteen feet. This tremendous surf is some of the best on Maui. Contemporary surfing got started on Maui at Hoʻokipa in the early 1930s, and in 1935 a small group of surfers formed the Hoʻokipa Surf Club. A small building that served as a clubhouse and a set of surfboard racks were donated and constructed in the park by Harold Rice. Foremost among the charter members were two brothers, Donald and Teruo Uchimura, who have both been avid surfers as well as great promoters of the sport of surfing since the founding of the club. During the later 1930s Hoʻokipa Beach Park was also used by the Hui Makani, a youth organization for the children of Lower Paʻia and Kuʻau. It was started by a policeman, Curtis Sylva, who often brought the children to the park to swim and surf. During World War II the park became a favorite party site of the men of the Fourth Marine Division, whose camp was at Kokomo. The destructive tsunami of April 1, 1946, completely altered the natural features of the park. Many of the hau trees and most of the wide sand beach were lost, and the high seawall that now borders the seaward edge of the park was constructed to prevent further damage. During the early 1960s a second Hoʻokipa Surf Club was formed on Maui. Originally called the Maui Surf Club, the members decided on the name Hoʻokipa Surf Club because the park was their usual meeting and surfing place. The guiding forces behind the new club were Barbara and William Meheula. Under their leadership the club became an outstanding and influential youth organization. The club participated in many community service projects, initiated the first Lanaʻi-Lahaina surfboard race, and coordinated a weekend of festivities that evolved into the annual Lahaina Whaling Spree. The club members were also the first to surf many of Maui's then virgin surfing grounds. They conceived names still familiar to surfers, such as Hot Sands, Lone Palm, and Pine Tree. In the early 1970s a new ocean sport called windsurfing was introduced to Hawaiʻi. Its popularity swept Oʻahu first and then moved to Maui. By the 1980s the international windsurfing community had discovered that the wind and waves on Maui, particularly at Hoʻokipa Beach Park, offered some of the most exciting board sailing sites in the world. Today the surf at Hoʻokipa hosts windsurfers from every corner of the globe and provides the venue for a number of major windsurfing competitions. at the park include restrooms, showers, picnic pavilions, and paved parking. A large parking lot on Hoʻokipa Point offers an excellent view of the park and the surf offshore. The park borders the Hana Highway. D. T. Fleming Beach Park is located in Honokahua, the third of six famous bays of West Maui collectively called Hono a Piʻilani, the "bays (acquired) by (Chief) Piʻilani." Honokahua literally means "sites bay," while the name of the beach park honors the memory of David ; Thomas Fleming (1881-1955). D. T. Fleming Beach Park, not to be confused with Fleming Beach, an alternate name for Kapalua Beach, is an improved park with restrooms, showers, picnic tables, barbecue grills, and a paved parking lot. The park is situated on low sand dunes that build considerably near Makiiluapuna Point, showing the direction of the prevailing wind. 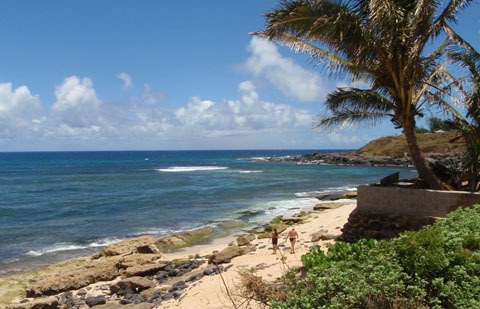 The long, wide white sand beach begins at Makiiluapuna Point, the site of the 16th hole of Kapalua's golf course, and ends at the low sea cliffs forming the east end of the park. A shallow sandbar, fronts most of the park's shoreline and extends offshore 4 to the edge of the surf. The shorebreak that builds up on heavy swells is often good enough for bodysurfing. The east end of the beach near the rocks is fronted by a shallow reef. Board surfers sometimes ride the surf there. When a swell hits the beach, dangerous rip currents develop in various places depending on the size and direction of the waves. The beach itself is steep, occasionally creating a backwash across the sandbar. The combination of these adverse water conditions has caused a number of drownings and necessitated many rescues at this well-used beach park. D. T. Fleming Beach Park is popular with local residents and visitors alike. It was set aside for public use by Maui Land and Pineapple Co., Inc., in 1975.